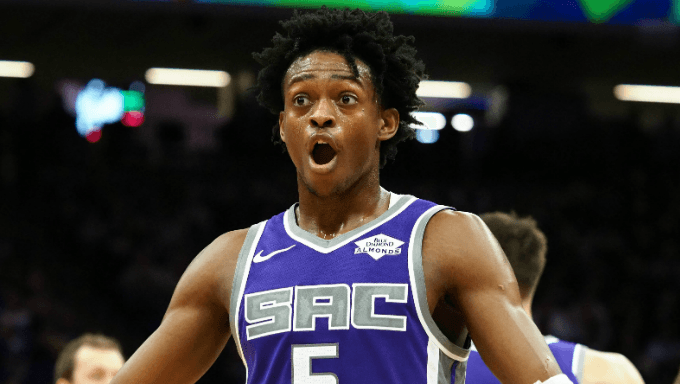 Is De’Aaron Fox the Bet for NBA Most Improved Player 2019? It’s not often the No. 5 pick flies under the radar in his rookie season, but that’s what happened to De’Aaron Fox last year. Top pick Markelle Fultz struggled mightily in Philadelphia. No. 2 pick Lonzo Ball’s wild ride in Los Angeles made him a headline every night. Even ninth pick Dennis Smith and his gravity-defying dunks made him a viral sensation. Fox? He was somewhat of an afterthought playing for the woeful Sacramento Kings. It wasn’t that he played poorly, but sharing the court with George Hill for half the season and being part of an actively tanking team in the second half didn’t provide the Kentucky product with much fanfare in his rookie season. Fox didn’t make either All-Rookie squad, and he watched as his impressive teammate Bogdan Bogdanovic was named to the second team. In 60 starts, Fox averaged a modest 11.6 points and 4.4 assists in 27.8 minutes, fine numbers for a 20-year-old on a 27-win team building for the future. But for the point guards of the 2017 draft class, Year 2 couldn’t be more different. Fultz’s recurring shoulder issues have him away from the team indefinitely. Ball has taken a backseat to Kyle Kuzma and Brandon Ingram with the Lakers, and Smith isn’t even the best guard on his team after the Mavs traded up for Luka Doncic in June. Fox? The 21-year-old is blossoming into a franchise point guard for a surprising Kings team and is quickly becoming a leading candidate for the Most Improved Player award. His raw numbers have been excellent. He’s one of seven players in the NBA averaging 17 points, 7 assists and a steal per game; the other six are households names: Harden, Paul, Holiday, Westbrook, Wall and Booker. He’s in outstanding company, and he actually has the best field-goal percentage (47.1%) and 3-point field-goal percentage (38.1%) of those seven players. Also, his 3.3 turnovers per game are second fewest on that list of seven, behind only Paul who has the luxury of playing with the ball-dominant Harden. Fox’s volume numbers combined with his percentages give him a PER (Player Efficiency Rating) of 17.3, ranked 91st in the NBA. That might not scream Most Improved Player, but consider that as a rookie he had a PER of 11.3 and was ranked 264th of a possible 353 players. Many young players make a leap from Year 1 to Year 2, but Fox’s has been significant. Should You Be Betting on the Sacramento Kings? Perhaps not this season, but the future certainly is brighter. It shouldn’t be surprising that the Kings are following suit. It’s unknown whether they’ll be able to sustain this pace, but they’ve been a massive overachiever in the season’s first month, racing out to a 10-10 record that has them in the thick of the playoff race in the crowded Western Conference. They earned their 10th win on Nov. 21; a year ago they didn’t win their 10th game until Dec. 19, and that victory made them 10-20. Seven of their wins this season have come against playoff teams from a year ago, so there’s some optimism that this start could maintain. It certainly will if Fox continues his stellar play. He’s the engine to this team. The Kings are 7.7 points per 100 possessions better on offense with Fox on the floor, and their defense is nearly 8 points better. Plenty is being asked of him and will continue to be asked of him, but Fox has stepped up to the challenge. He’s the real deal. For NBA betting fans, that spells opportunity. So, will he win the league’s Most Improved Player award? It’s rare for a second-year player to bring home the award, but Fox is the right in the thick of things with the leap he’s made in Year 2. A lot will depend on the Kings continuing to win, but the NBA is rapidly becoming a point guard’s league and the Kings have a good, if not great, one. If Fox can be the leader to snap the Kings’ NBA-worst 12-year playoff drought, he’ll get serious consideration for this award. For now, he has excellent value at +450 with 888Sport to be the league’s Most Improved Player.